If music impacts your life, consider supporting one of two wonderful charitable organizations: Grammy Foundation or MusiCares. I am honored to co-captain for the Texas Chapter of The Grammy's the 2010 Giving Campaign. ... a talented student whose school's music budget has been cut? ... a music professional who doesn't have health insurance and is facing eviction? ... a music archive in peril of being lost for lack of preservation funds? MusiCares and the GRAMMY Foundation work to solve these issues every day. Now you can help. Join "Giving 2010," the first annual GRAMMY Charities Grassroots Giving Campaign — April 1 through May 15. Make your own donation — no matter what size — to MusiCares and/or the GRAMMY Foundation. Or help raise money from friends who share your love of music. Ask for donations in lieu of birthday gifts. Use your social networks to engage others in the cause. Share your tip jar for the duration of the campaign. Everyone has a part to play. Because No One Should Have To Go Solo. On Saturday, May 30, Dallas Public Library’s Fine Arts Division will host a one-day conference on the history of Texas music. 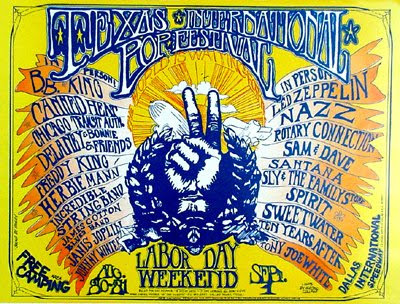 Twelve sessions will be offered covering a wide range of performers and styles, including Stamps-Baxter and Southern Gospel music, Texas blues, rock bands from the 60s, two noted women in Texas music, the Texas International Pop Festival, jazz in Texas, the Big D Jamboree, and more. Two film screenings will be included in the day: Teen-a-Go-Go and South Dallas Pop. Although the conference is free, space is limited, so advance reservations are requested. To register for the event, please visit http://texasmusic.eventbrite.com. Stairway to Money: Value of "Stairway to Heaven"
Take a look at how the value of Stairway to Heaven is determined. $572 million sounds good to me! I would like to take a few blog entries over the next week to highlight how we work with clients to protect and leverage their intellectual property. On the entertainment side of our practice, our primary focus is administration of music publishing and master recording catalogs. Because of my extensive background in music publishing and specifically in working with the 1909 Copyright Act, we focus this practice on “estate” catalogs. Typically we work with the surviving heir or heirs to a music publishing catalog or master catalog. Depending on the need of the client, we may be the point person for any and all licensing issues as well as investigating possible unlicensed uses, ie, infringements. For songs written before January 1, 1978 we also work closely with the client to terminate grants made under the 1909 copyright act and reclaim works for the heirs. We may also work with the client to investigate other revenue sources for the songs/masters in the catalog through song placement. I have a real passion for educating folks on how the music publishing business works and how to protect their creative endeavors. I lecture on the topic of music publishing frequently. Please feel free to contact me if you feel your group might benefit from a Music Publishing 101 lecture or an advanced music publishing presentation. Remember, every hit record starts with a great song! Fortunately for our generation, and those to come, there are folks with a passion to not only preserve the recorded music of the late 1800's-1900's, but to also introduce new listeners to these amazing recordings. Many of the recordings from this time period have been lost forever because the master recordings have been destroyed or are in a music vault collecting dust. NPR has a wonderful article on Archeophone Records, a small label that is run out of a house in Illinois. Archeophone has released 40 CDs, some focusing on individual styles and periods, others devoted to specific performers. In 2006 the label received a Grammy for best historical album. Music CD's/sound recordings are an interesting bird when it comes to protection of the work under the law. Works created on or after February 15, 1972 are protected by U.S. Federal Copyright Laws. Works created prior to that time, which clearly include the focus of Archeophone, are protected by state laws. Throughout the years, states have enacted criminal copyright infringement laws for copying pre '72 works. When you consider works from the 1800's and the first decade of the 1900's, the underlying musical composition has passed into the public domain, meaning no royalty would be paid to a music publisher or songwriter for selling a CD that includes that particular song. If the songs are in the public domain, does that mean the sound recording, the physical recording of the song, may also be freely distributed without compensation to the record label (or its assignee) that created the sound recording? The highest court in New York ruled in 2005 that New York state common law copyright for sound recordings grants copyright protection in perpetuity. This means, a master license fee should be paid to the copyright holder for the ability to reproduce the sound recording, no matter how long ago the original recording was made. Hopefully, the fees will be minimal so that preservation will be encouraged. Learn more about preservation projects through the University of California. Also, run a web search on "music preservation project" for many interesting links.